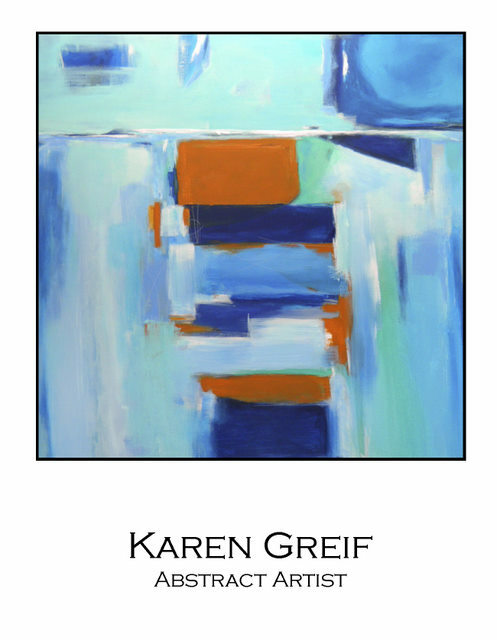 Abstract influences have been very strong in Karen Greif's work. Painting a representational chair isn’t as exciting as interpreting a chair as an abstract. The challenge is to paint the essence of a chair without its form. With acrylic paint and other media, her colors assume lines, shapes, composition and balance. The painting leads Greif and tells her what to do next. Karen Greif was raised in California and attended workshops and classes throughout the years absorbing influences from her work in interior decorating, refinishing furniture, tole painting, Ikebana, mosaic tile work and other crafts. She is a full-time painter and her work leans towards Asian influences.